An original black and white illustration as shown here, rendered on letter-size Bristol board and inked with archival-quality marker. Unless the illustration is unusually complicated — think “Where’s Waldo?” — I charge $150. Computer coloring the illustration (my cartoons print better when colored digitally), $100. Printing the cards. 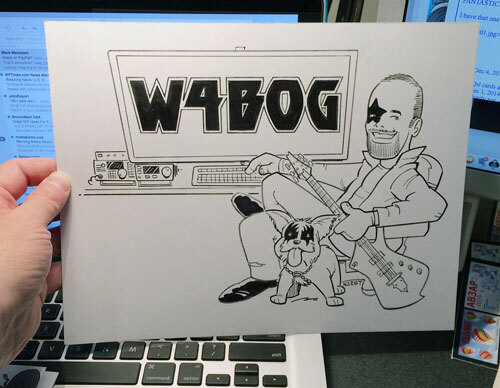 Hamtoons QSL cards are a standard 5½” x 3½”, printed on sturdy 16-point stock, color and UV coating on the front, black and white on the back. Any extra typography and one of several standard report forms are included at no extra charge. All cards for U.S. hams are printed in the United States. (QSLs for DX stations are typically printed outside the U.S. and may cost more.) Prices are $85 for 250 cards, $95 for 500 cards or $115 for 1,000 cards. If you move and need to have your cards reprinted, I’ll update your QTH info free of charge. If you need to economize, I can leave the cartoon black and white and charge $100 less. Payment is accepted via PayPal. The total cost is invoiced and must be paid when the cartoon is completed and approved. The final job is then sent to press.